The Volkswagen Beetle is a classic compact car. From generation to generation, its iconic design has been a favorite among drivers looking for a vehicle that’s both sporty and fun. If you’re shopping for a used model that looks and drives like new, consider buying one that’s certified pre-owned. Toms River Volkswagen put this certified pre-owned Volkswagen Beetle review together to show drivers in Toms River, Brick, and Freehold the advantages of going with this great in between option. Contact us today to schedule a test drive! A certified pre-owned Volkswagen is a car or SUV that’s only a few years old, still has relatively low mileage, and passes a 100+ point inspection. This inspection is conducted by our service center’s team of technicians. They’ll examine everything from how the interior looks, to major systems like the engine, transmission, brakes, and power steering system. Once it passes, we’ll write up a CARFAX Vehicle History Report™, so you can easily find out everything you want to know about the car. Why Buy a Certified Pre-Owned VW Beetle? A certified pre-owned Volkswagen Beetle offers lots of features and agile handling inside a sporty compact car. The interior features more space than meets the eye with 41.3 inches of front legroom and 31.4 inches of rear legroom. On top of being comfortable, the cabin is designed to offer an exciting feel. There’s a sporty performance gauge cluster, V-Tex leatherette seats, and a leather-wrapped steering wheel and shift knob. You’ll also be able to enjoy great music through the Premium VIII touchscreen on your dashboard. It offers SiriusXM® Satellite Radio and it’s Bluetooth®-compatible, so you can stream music from your phone or make hands-free phone calls. Under the hood, you’ll have an efficient powertrain with a 2.0L 4-cylinder Turbodiesel engine that gets up to 140 horsepower. This works with a 6-speed automatic transmission. Together, they’re able to get up to an EPA-estimated 28 MPG city and 37 MPG highway. The certified pre-owned Volkswagen Beetle is capable in all seasons too. It has standard heated windshield washer nozzles, body-colored heated power side mirrors, and heated front seats. When the sun’s out, drop the power-folding cloth top and enjoy it as a convertible. Plus, you’ll also have peace of mind inside with front airbags, an Intelligent Crash Response System, and Lower Anchors and Tethers for Children (LATCH). With its dependable drivetrain and safety features, it was even named a 2013 TOP SAFETY PICK by the Insurance Institute for Highway Safety (IIHS). Visit Toms River Volkswagen to test drive a stylish and efficient certified pre-owned Volkswagen Beetle. This iconic car will look great and deliver a reliable performance during all your drives around Toms River, Brick, and Freehold. 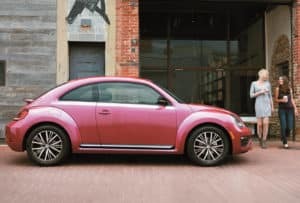 To learn more about this certified pre-owned VW Beetle review, find our certified pre-owned Volkswagen dealer near you.